Thank you Lalo for all the effort you have put into seeing this happen. I remember when you mentioned this to me in the beginning and you sir stuck to it and now we will be racing.great job!!! I need some also 5 gallons. Thought about a drum but don't think I would use it all anytime soon. Was a fun place. Sad to hear what's happening to it. Sadly negotiations to close it down happened a heck of a lot faster than the ability for it to be saved. Nothing said all season about possibility of it closing, even 2017 dates posted on website then boom it's closed. Fastest negotiations for new bigger deal and plans to close track I have heard of, Hmm just my .02 a deal to move on was in works and it if people had known maybe a deal could have been put in place instead of trying to throw a last minute deal together. The ones who truly loose are the people thought the place would be open for 2017 and bought,built or rebuilt cars. Most tracks you know it's coming. 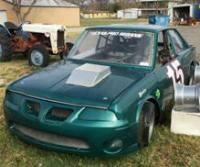 Is there any where near San Antonio where you can run what was a TPS car as a mini stock. I see where front wheel drive cars are welcome but no red. With the recent suspension of TPS season I would think this could be a good way for tracks like STS and I37 to have even better car turn out. So guess it is safe to figure it won't be opening again anytime soon at least. Is there been any new word on status? I am sure I am not the only one courious as to weather there will be racing. Or vacant track and expensive toys sitting. So can a mini stock run in this class? Why did they black flag him? I am looking for a set of 13" wheels with 4x4 1/4 bolt pattern. I have 2 sets of 4*41/2 bolt pattern wheels one set are Aero 13x10 still in boxes and other set is a set of used Diamond wheels. I will buy your wheels or trade or even sell the ones you have.